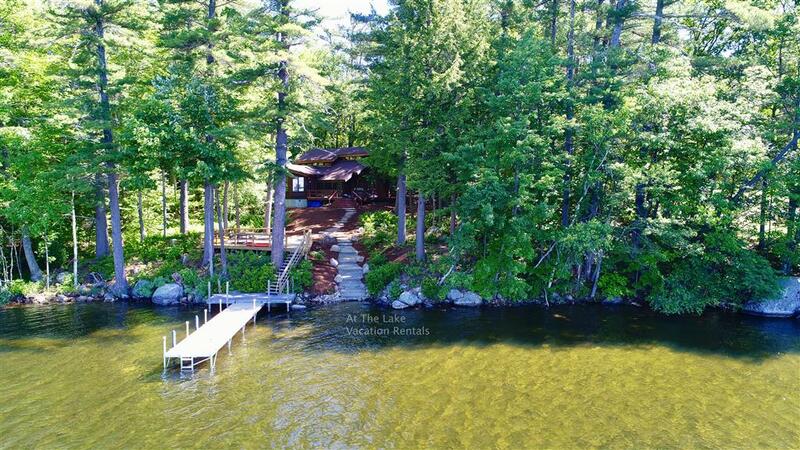 Quintessential Winnipesaukee log home sleeping 11 with 4 bedrooms and 2 & 1/2 baths. 210 feet of shorefront on 2 & 1/2 acres! This home was recently purchased and extensive renovations have taken place. Updates include a new kitchen and 2 full baths as well as landscaping. New furnishings, TVs, etc. plus a new docking system for up to two 24 foot boats! Window A/C's in both main level bedrooms. This home was featured in Better Homes and Gardens when it was built in 1979. The main level has 2 bedrooms and 2 & 1/2 baths. The upstairs has 2 bedrooms. A living room plus a family room gives endless options for you and your vacation-mates to congregate - and don't forget the screen porch and deck on the water! Remember to bring your marshmallows and graham crackers for evening s'mores around the fire pit while planning our your next days adventures. Challenge your vacation-mates to a game of corn-hole after dinner. 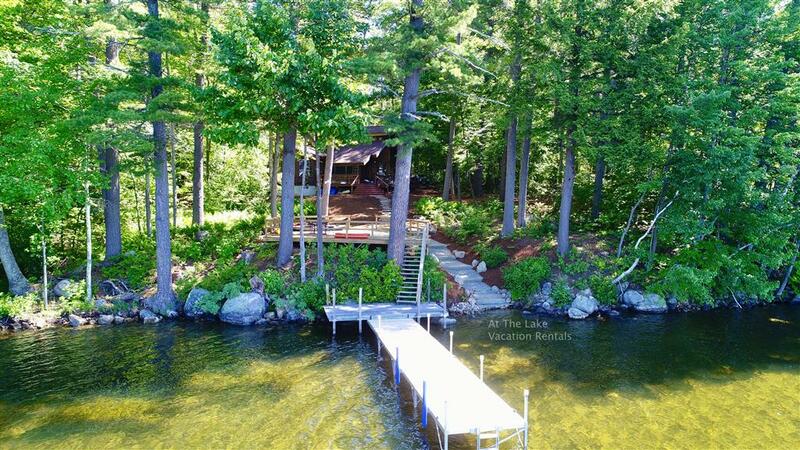 Resting on a beautiful SW facing lot, this one-of-a-kind property offers beautiful lake views and breathtaking sunsets. 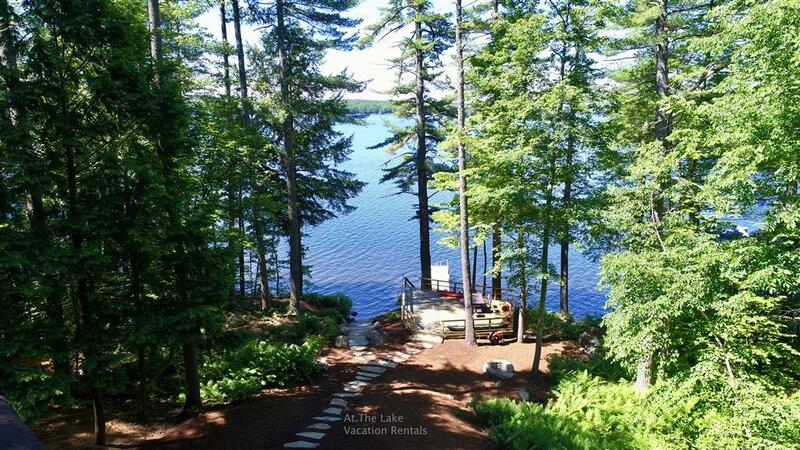 Just a 15 minute drive from the picturesque Town of Wolfeboro where you can board the MS Mt. Washington for a dinner cruise around the lake and browse the many shops or just an 8 minute drive into Melvin Village for your evening ice cream cone. 3 kayaks are also included for your shoreline paddle. If you would like to rent linens, the fee for this property is $120 for sheets and $12 per person for towels. If you would like to have the beds made for you, the fee is $8 per bed. AFTER LABOR DAY SPECIAL: $393 PER NIGHT PLUS TAX AND FEES - 3 NIGHT MINIMUM. Rooms Main Level: Bedroom 1: King. Bedroom 2: Queen. Second Floor: Bedroom 3: Bunk Bed (2 Twins). Bedroom 4: Bunk Bed & Twin (3 Twins). Family Room: Full Sofa Bed. Start at beginning: the driveway has space for at least a half-dozen cars and a boat trailer. The interior is rustically beautiful and neat as a freaking pin with comfortable and clean furnishings and completely outfitted with all you need (paper towels, salt and pepper, trash bags, dishwasher detergent). There are plenty of common areas and room to "hide" as well. Grill and outside fire pit are both top notch. Massive deck overlooking water is a great gathering spot and the dock is plenty big enough and brand new. We had two Jet Skis tied off and rented a 24-foot pontoon boat for a day and had all tied off nicely. The cove provided nice shelter on a windy day on the open water for tubing and jet skiing. Boat launch behind church 1/4 mile away is where we dropped skis in and Melvin Village Marina folks were great with boat rental and certification. Coffee shop (Pine Cone) 3 minutes away and bigger market (Skelley's) 10 minutes. Ridgewood CC was a very fun course to play and moved quickly. Really enjoyed with my wife, three college-aged sons and their three friends. "We had a wonderful week at this property. The house is well-maintained, with rennovated kitchens and bathrooms. Location has a lovely view and we appreciated the opportunity to have lunch outside on the deck overlooking the lake. As noted in another review, the bunk beds upstairs are twin-sized and may be a tight fit for adults. That said, our children loved them. Only negative is that the property is a hike to the larger grocery stores in Wolfeboro or Meredith (15 min to 20 min). Swimming area has a nice soft bottom and good privacy relative to neighboring properties." "Rented the property and a boat for a week. Unfortunately it rained almost every day off and on. (more on). Didn't even get to use the boat. However the house is beautiful, and the setting is very private which is hard to find. The beach is great, but not quite deep enough to dive off the end of the pier. The deck by the water is fabulous, even though we were only able to use it twice. The screened porch was nice for coffee in the morning when it was raining. The kitchen and baths have been nicely remodeled. The beds and couches were very comfortable. The main drawback was the steps inside and outside. A little tricky to get used to, and I'm not a spring chicken any more! Something that could make it better would be central AC. Also would love some steps from the dock to the beach. The fridge could be replaced or repaired with a new seal as it doesn't close properly. For nearby food, Buckey's is good if you need a break from cooking. Our favorite is Canoe in Center Harbor. We were sad to leave, but may be back to visit as my brother in law is renting the week after us! " "We had a n absolutely fantastic week. The house was recently renovated and immaculate. The improvements made to the house really enhanced our week. Our only disappointment was the size of bunk beds-the house lists as sleeps 11-5 of those beds are small bunk beds-too small for adults."